Hans Arp, 1922: 'Shirtfront and fork' - relief in painted wood, c. 1922; location National Gallery of Art, Washington D.C. Structures of lines, surfaces, forms, colours. They try to approach the eternal, the inexpressible above men. They are a denial of human egotism. They are the hatred of human immodesty, the hatred of images, of paintings.. Wisdom [is] the feeling for the coming reality, the mystical, the definite indefinite, the greatest definite. I met Sophie Taeuber in Zurich in 1915. Even then she already knew how to give direct and palpable shape to her inner reality. In those days this kind of art was called 'abstract art'. Now it is known as 'concrete art,' for nothing is more concrete than the psychic reality it expresses. Like music this art is tangible inner reality she was already dividing the surface of a watercolor into squares and rectangles which she juxtaposed horizontally and perpendicularly. She constructed her painting like a work of masonry. The colors are luminous, going from rawest yellow to deep red or.. ..blue. We [Hans Arp and Sophie Taeuber ] painted embroidered and made collages. All these works were drawn from the simplest forms and were probably the first examples of concrete art. These works are realities pure and independent with no meaning or cerebral intention. We rejected all mimesis and description, giving free reign to the elementary and spontaneous. Arp's critical quote refers to the creation of art by the French Surrealists in which Jean Arp participated for a few years and then departed. Concretion signifies the material process of condensation, hardening, coagulating, thickening, growing together. Concretion designates the solidification of a mass. Concretion designates curdling, the curdling of the earth and the heavenly bodies. Concretion designates solidification, the mass of the stone, the plant, the animal, the man. Concretion is something that has grown. I want my work to find it. A painting or sculpture not modeled on any real object is every bit as concrete and sensuous as a leaf or a stone.. ..[but] it is an incomplete art which privileges the intellect to the detriment of the senses.. .[art must be like..] fruit that grows in man, like a fruit on a plant or a child in it's mother's womb. art is fruit growing out of man like the fruit out of a plant like the child out of the mother. While the fruit of the plant grows independent forms and never resembles a balloon or a president in a cutaway suit the artistic fruit of man shows for the most part a ridiculous resemblance to the appearance of other things. Reason tells man to stand above nature and to be the measure of all things. thus man thinks he is able to live and to create against the laws of nature and he creates abortions. through reason man became a tragic and ugly figure. i dare say he would create even his children in the form of vases with umbilical cords if he could do so. reason has cut man off from nature. Quote of Jean Arp, referring to Swiss Dada in Zurich after 1914. As the thought comes to me to exorcise and transform this black with a white drawing, it has already become a surface.. .Now I have lost all fear, and begin to draw on the black surface. These paintings, these sculptures – these objects – should remain anonymous, in the great workshop of nature, like the clouds, the mountains, the seas, the animals, and man himself. Yes! Man should go back to nature! Artists should work together like the artists of the Middle Ages. In 1915, w:Otto van Rees, A.C. van Rees, Freundlich, S. Taeuber [his wife] and Arp made an attempt of this sort, as Arp mentioned himself. [art] urges man to identify himself with nature. Automatic poetry comes straight out of the poet's bowels or out of any other of his organs that has accumulated reserves.. .He crows, swears, moans, stammers, yodels, according to his mood.. .His poems are like nature; they stink, laugh, and rhyme like nature. Foolishness, or at least what men calls foolishness is as precious to him as a sublime piece of rhetoric. For in nature a broken twig is equal in beauty and importance to the clouds and the stars. H. A.: The nightingales have had enough of your hymnal Karagösen. Play violin on parrots, but avoid the women red hood ans snow widow. K. Schw. : Should I pe-trify something for you? Or would you like play cry together? H. A.: Should we wash our tears or drown them? K. Schw. : You are a sipsnipper, Since when do your diamonds bark? H. A.: The water is getting hard. A fruit cries out loud and gives birth to a fish. K. Schw. : I'll p-ut it in the sea, or should I st-ab you with it? Then we went down to his work room, in the horrible beautiful Merz grotto [the 'Merz-Haus', built by Kurt Schwitters, where broken wheels paired with matchboxes, wire lattices with brushes without bristles, rusted wheels with curious Merz cucumbers.. .How often did we 'p-lay' in this room! Schwitters called playing, considering the sweat, working. There we glued together our paper pictures, and as I tossed away one of my glued-together works one morning, Schwitters asked, 'You don't like it? Can I have it?' – 'What do you want with this failed piece of toast?' Schwitters took a good look at it and said, 'I'll put what's on top on the bottom, I'll stick a little Merz nose in this corner and I'll sign the bottom Kurt Schwitters.' And, yes indeed, this collage became a wonderful picture by Kurt Schwitters. Schwitters was a wizard, just as Hokusai was a wizard. Sculpture should walk on the tips of its toes, unostentatious, unpretentious, and light as the spoor of an animal in snow. Art should melt into and even merge with nature itself. This is obviously contrary to painting and sculpture based on nature. By so doing, art will rid itself more and more of self-centredness, virtuosity and absurdity. A deep and serene silence filled her structures composed of colors and surfaces. The exclusive use of horizontal and vertical rectangular planes in the work of art, the extreme simplification, exerted a decisive influence on my work. Here I found, stripped down to the limit, the essential elements of all earthly constructions: the bursting, upward surge of the lines and the planes toward the sky, the verticality of pure life, and the vast equilibrium, the sheer horizontality and expansiveness of dreamlike peace. Her work was for me a symbol of a divinely built 'house' which man in his vanity has ravaged and sullied. a remark on the art of Sophie Taeuber, whom he later married. In 1915 Sophie Taeuber and I carried out our first works in the simplest forms, using painting, embroidery and pasted paper [without using oil colors to avoid any reference with usual painting]. These were probably the first manifestations of their kind, pictures that were their own reality, without meaning or cerebral intention. We rejected everything in the nature of a copy or a description, in order to give free flow to what was elemental and spontaneous. It was Sophie [Taeuber] who, by the example of her work and her life, both of them bathed in clarity, showed me the right way. In her world, the high and the low, the light and the dark, the eternal and the ephemeral, are balanced in prefect equilibrium. By the time I was 16, the everlasting copying of stuffed birds and withered flowers at the Strasbourg School of Applied Art not only poisoned drawing for me but destroyed my taste for all artistic activity. I took refuge in poetry. I tried to be natural, in other words the exact opposite of what drawing teachers call 'faithful to nature'. I made my first experiments with free form. We do not wish to copy nature. We do not want to reproduce, we want to produce. We want to produce as a plant produces a fruit and does not itself reproduce. We want to produce directly and without meditation. As there is not the least trace of abstraction in this art, we will call it concrete art. p. 183: Serge Fauchereau (1988) in Arp, p. 20 commented: 'Even though his work was nonrepresentational, Arp disapproved of the term 'abstract art' being applied to it, as he often explained with the above quote'. I wanted to find another order, another value for man in nature. He should no longer be the measure of all things, nor should everything be compared with him, but, on the contrary, all things, and man as well, should be like nature, without measure. I wanted to create new appearances, to extract new forms from man. This is made clear in my objects from 1917. Already in 1915, Sophie Taeuber [his wife] divides the surface of her aquarelle into squares and rectangles which she then juxtaposes horizontally and perpendicularly [as Mondrian, Itten and Paul Klee did in the same period]. She constructs them as if they were masonry work. The colors are luminous, ranging from the raw yellow to deep red or blue. p. 288, Arp refers in this quote to the structure in the early watercolor paintings by his wife Sophie Taeuber. I allow myself to be guided by the work which is in the process of being born, I have confidence in it [Arp refers to 'automatic creation of art']. I do not think about it. The forms arrive pleasant, or strange, hostile, inexplicable, mute, or drowsy. They are born from themselves. It seems to me as if all I do is move my hands. Like the disposition of planes, the proportion of these planes and their colors seemed to depend only upon chance, and I declared that these works were ordered 'according to the law of chance', just like in the order of nature. Since the time of the cavemen, man has glorified himself, has made himself divine, and his monstrous vanity has caused human catastrophe. Art has collaborated in this false development. I find this concept of art which has sustained man's vanity to be loathsome. I like nature but not its substitutes. Naturalist art, illusionism, is a substitute for nature. I remember that in arguing with Piet Mondrian [in Paris, 1920's], he opposed art to nature saying that art is artificial and nature is natural. I do not share this opinion. I do not think that nature is in natural opposition to art. Art's origins are natural. Each one of these bodies [art-works which Arp made] certainly signifies something, but it is only once there is nothing left for me to change that I begin to look for its meaning, that I give it a name. I did exhibitions with the Surrealists [in Paris, c. 1929] because their attitude revolted against 'art' and their attitude toward life itself was wise, as was Dada's. These collages were static symmetrical constructions, portico's with pathetic vegetation, the gateway to the realm of dreams. They were done with colored paper in black, orange or blue dye plates. Although cubist painting interested me very much, not a trace of their influence was to be found in my collages. p. 420 - quote on his early collages, Hans Arp made ca. 1914. Ever since my childhood, I was haunted by the search for perfection. An imperfectly cut paper literally made me ill, I would guillotine it. My collages came undone, they became blistered. I then introduced death and decay in my compositions. I reacted by avoiding any precision from one day to another. Instead of cutting the paper, I would tear it with my hands. At daybreak I found on my sculptor's turntable a little mischievous form [a small plaster form of Impish Form, Arp made in 1949], alert and somewhat obese, with a stomach like a lute. It seemed to me like an imp. I called it that. And all of a sudden one day this little character, this imp, through a Venezuelan medium, found itself to be the father of a giant [Arp enlarged it]. This giant son resembles its father like an egg resembles another egg, a fig another fig, a bell another bell. To be full of joy when looking at an oeuvre is not a little thing. Soon silence will have passed into legend. Man has turned his back on silence. Day after day he invents machines and devices that increase noise and distract humanity from the essence of life, contemplation, meditation.. ..tooting, howling, screeching, booming, crashing, whistling, grinding, and trilling bolster his ego. His anxiety subsides. His inhuman void spreads monstrously like a gray vegetation. Yes, I deal with accidents, just as Arp admits it all the time. And I admit it, too. But I like to have them under my command and not sign them because they are accidents. Based on the metaphysical implications of the Dadaist dogma.. .Arp's Reliefs [carvings] between 1916 and 1922 are among the most convincing illustrations of that anti- rationalistic era...Arp showed the importance of a smile to combat the sophistic theories of the moment. His poems of the same period stripped the word of its rational connotation to attain the most unexpected meaning through alliteration or plain nonsense. Tzara would draw [during Dada-evenings in Zürich, Switzerland] slips of paper with words described on them from a hat, and present the resulting combination of words as a poem. 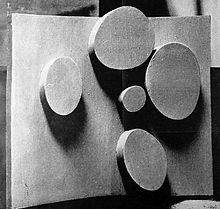 Arp allowed cut-outs of free or geometric shapes to arrange themselves in a random order, then pasted them on a surface and presented the result as a picture. In the course of such experiments Arp also used 'automatic writing', i.e. : irrational, spontaneously traced forms, rising from the unconsciousness. We visited Meudon [c.1938] to see Hans Arp and though, to our disappointment, he was not there and his wife, Sophie Taeuber showed us his studio. It was very quiet in the room so that one was aware of the movement in the forms.. .I thought of the poetic idea in Arp's sculptures. I had never had any first-hand knowledge of the Dadaist movement, so that seeing his work for the first time freed me of many inhibitions and this helped me to see the figure in landscape with new eyes.. .Perhaps in freeing himself from material demands his idea transcended all possible limitations. I began to imagine the earth rising and becoming human. Dada was founded in Zurich in the spring of 1916 by Hugo Ball, Tristan Tzara, Jean Arp, Marcel Janco and Richard Huelsenbeck at the Cabaret Voltaire [in Zurich, Switzerland].. .Arp was an Alsatian; he had lived through the beginning of the war and the whole nationalistic frenzy in Paris, and was pretty well disgusted with all the petty chicanery there, and in general with the sickening changes that had taken place in the city and the people on which we had all squandered our love before the war [World War 1., 1914-1918]. Mr. Arp hated shiny sculptures. He hated that. Because if it's shiny, you can't appreciate the form. It creates reflections. I never stood under the influence of Dadaism because whereas the Dadaist created Spiegel-dadaismus (Mirror-Dada) on the Zurich Lake [the 'political Dada'], I created MERZ on the Leine-river, under the influence of Rembrandt. Time went on, and when Jean Arp made concrete Art, I stayed Abstract. Now I do concrete Art, and Marcel Duchamp went over to the Surrealists.. ..and at all I have much fun about Art.